Mommy is tired, it is late Thursday evening, there are no fresh fruits for the next day afternoon snack at school, so Mommy retrieves the lone chocolate pudding cup from the pantry and packs it for snack next day. “Mmmmmm…” goes Mommy, “not very but it is ok to have once in a while”. Mommy reassures both the kiddo and herself. After all a chocolate pudding once in two weeks can do no big harm given bigger scheme of things like global warming or even tumbling economy, she thinks. I try to make her eat healthy but I am not paranoid about it. Edibles like chips, soda and candy were strictly prohibited till age of three. After that she was allowed some in moderation but since she does not like any kind of soda and chips are not stocked at home she gets to eat them only occasionally. Given that she was a pretty picky eater initially and would not munch on her veggies, I see a great change in her however. For a long time the best way to get veggies into her were making her favorite chicken stew and rice. She liked eggs and also developed a strong love for fish by the time she was 3, and also became more experimental about eating around at that time. Though she wouldn’t still munch on a raw carrot she was more open to trying out new vegetables and even new dishes. These days she eats a balanced Indian meal at home, ok maybe not everything that I cook but she tries out most of them. She is also more aware of the food she eats and even munches on baby carrots with a dip, piping in a question every now and then about the health benefit of the meal offered. Though aware of the golden arch, she is not really interested in them or their toys and happy to share a sandwich with us at Panera breads instead. I think her school and her teacher also has an important role to play in her food and I am really thankful for that. ***Knock on Wood***.But for all moms who despair about their little ones meal habits, I can only assure it gets better so don't break your head over it. 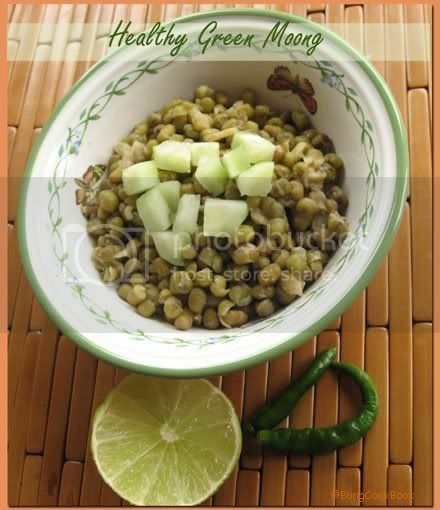 This Whole Green Moong in the microwave is a quick and delicious way to get the goodness of the grain if you haven’t had the time to sprout them. You can soak them for a couple of hours or overnight. Since I did it for breakfast, I soaked them overnight. This is usually eaten by itself and you can serve it for breakfast, lunch or snack whatever you prefer. Since my friend R~ taught me this we make it pretty often at home and you have infinite possibilities to jazz it up the way you wish. I just realized I could send this for WBB#20 -- Balanced Breakfast at Mansi's Fun and Food. It has Whole Grains and also cucumber & onions, so it meets her requirement I guess, so there it goes. To it add the green moong which had been previously soaked. 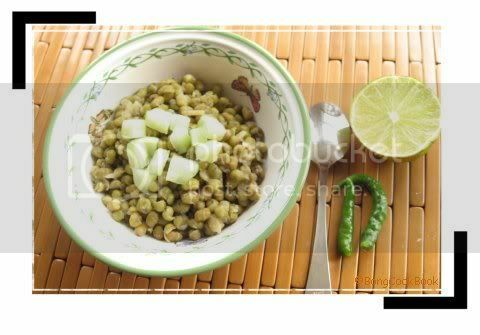 Depending on the time you have soaked the moong, the amount of water and time to microwave may vary. This is the reason I do it in chunks of time. Garnish with lime juice, chopped cucumber and chopped red onions. BTW, if you are a Mom and are on the verge of deciding on schools for your kid, you might find good information on Desi Momz Club this month. Most of them are about school admissions in India and you can send your input if you like. 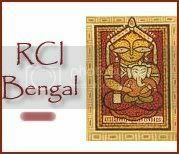 I finally got some time to come up with an icon for RCI Bengal. 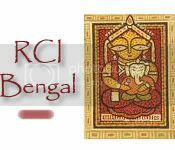 Please feel free to use the above image in your posts for RCI Bengal. To kick off RCI Bengal, I decided to showcase two essential instruments from the Bengali or rather Indian Kitchen. One of them you see here today. I am not sure if this was used all over India, so please enlighten me. I know for sure that almost all respectable household in Eastern part of India carry it and though it has been relegated to the dark corner besides the “alu-piyaj er jhuri” after the advent of shiny Anjali knives, it is till brought out on good days when Ma’s knee doesn’t hurt that much and there is ample time to sit on the floor and take care of the myriad veggies. Yes I am talking about “The Boti”, a unique cutting instrument, used by Bengali women where you have to squat on the floor, press the wooden plank to the floor with your feet and cut fruits and veggies on the sharp, curved menacing looking iron blade. You have both your hands free to hold the veggie and peel and then cut it. The serrated tip pf the boti also served the purpose of grating coconut and it was much faster than any other method I have seen. A larger version of the same boti, with a bigger blade is used for gutting & cutting fish. So you see the average Bengali household would carry not one but at least 3 boti of different sizes and a separate one for the Puja Room alone. Growing up I hardly saw my Ma or Aunts use knives for chopping veggies, fruits yes but veggies no. The daily morning ritual would be to sort out the veggies bought fresh from the market or from the “sabjiwali” who brought fresh fares home and then would start the peeling, chopping, cutting. The various boti were brought out and the household help along with the oldest member of the family would sit down on the floor to start on their task. Gossips were shared and tea sipped at while the veggies were cubed and the fish gutted. As we moved away from the joint family to another city, the morning chores were no longer that leisurely for my Ma but the boti still held its place. I too was apprenticed in cutting vegetables with the boti and took to it ok, though I wasn’t very fast with it. Slowly my Ma’s knee started giving her trouble and squatting on the floor was no longer that easy. It was the household help who was in total charge of he boti now until one fine afternoon, the intruder came home. A chopping board and a set of shiny knives entered the household but the boti was yet to be ousted. No one was really happy with the knives and the chopping board and my Ma grumbled about how it wasn’t the same thing. My Ma now largely relies on the knives and I got her a good set from here, but the boti is still there and the help still uses it to cut veggies. Hello, hello, hello. Here I am rising from my stupor only to insist and prod that you cook Bengali Food for RCI-Bengal. Light years ago I had signed up to host it and then promptly forgotten all about it until Dear Asha poked my memory which was hibernating through the cold North East Winter. There are apologies due and then there are more apologies due to all those who came and found nothing on my blog all these days, yes not even a reply to the comments. "Cheeeeeeeee, how rude that Bong girl is", hushed people in dark corners of the Blogosphere, given that they didn’t have better things to hush about on a boring blog day. 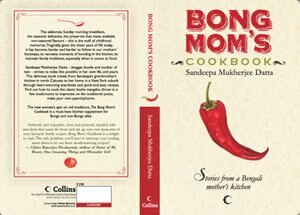 And in response all I have to say is let bygones be bygones and don your apron, scour the net and cook up a Bengali dish. If you don’t want to eat it at the end of the day, I don’t care, just take a nice, alluring pic and post the recipe on your blog anytime between now and eternity. No sorry, that’s too long, let’s say the next one month. So the deadline is fixed at April 15th, 2008. You can add more things in the mail like the offer to transfer funds in millions from your bank in Timbuctoo to my account or the promise to enhance appendages I don’t even own. But all this is not necessary and will NOT be posted as part of the round up. Given that I was away too long and am not sure why I don't see Dining Hall and whether Food Blog Desam is up and whether people still visit my blog, I would rely on any of you hitting on this post to spread the word around.